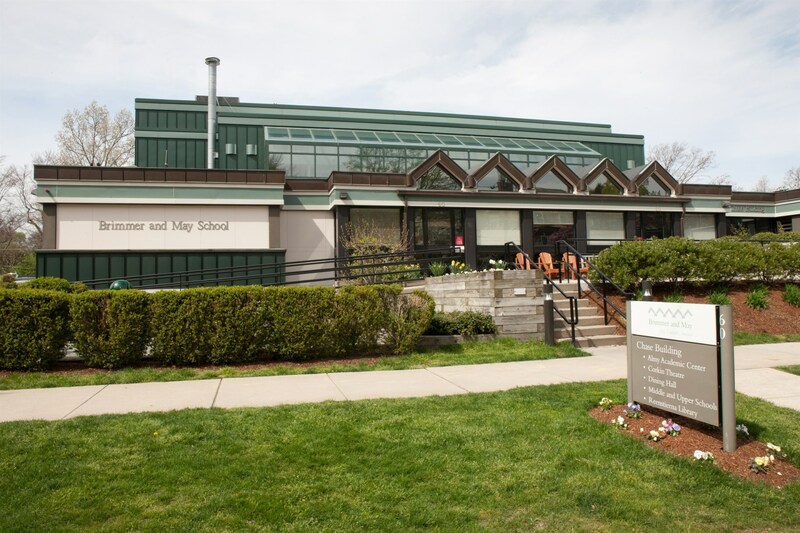 Brimmer and May School is a private school located in the Chestnut Hill village of Brookline; it enrolls students from pre-Kindergarten through twelfth grade. Although Brimmer and May was an all-girls school for about 50 years since its founding, the school became a co-educational institution in 1992 and has enrolled both males and females since. The school contains about 400 students and 50 faculty members, enabling a small 20:1 student to faculty ratio. Brimmer and May School emphasizes active learning and encourages students to approach their education with joy and responsibility by becoming leaders inside and outside the classroom. The school is also quite diverse as 20% of the students are international and 22% are U.S. students of color. The campus of Brimmer and May is located in Chestnut Hill close to the Boston College campus. Brimmer and May, which occupies a two-block stretch of Middlesex Road, consists of both lower school and upper school buildings, which include a visual arts center and a library. The academic mission and philosophy for Brimmer and May varies throughout the lower school, middle school, and upper school. The important development of young students’ intellectual, physical, social, and emotional skills is an academic emphasis in the lower school. The lower school also has several unique programs, such as the Afterschool Music Program and the Environmental ColLab. Students in the middle school build their academic knowledge and skills while simultaneously becoming both self-motivated and self-disciplined; the unique programs for the middle school of Brimmer and May include a 7th grade trip to Washington, DC and an Outdoor Education Program. Finally, the upper school encourages students to challenge themselves intellectually while also aiming to mimic a college academic environment in some areas. Brimmer and May upper school offers a variety of AP courses and a rigorous Honors Program. Furthermore, all seniors are required to complete a thesis, which they defend in front of a panel of faculty and classmates. Community service is at the heart of the Brimmer and May mission and students at all grade levels serve their community. While the students in the lower and middle schools participate in community service plans designed by the school, students in the upper school can choose in what way they would like to help their community as long as they complete the 40-hour requirement. Brimmer and May has 25 varsity sports for the upper school, and the lower and middle school students are required to participate in physical education every year. There are also art programs for each grade level and many clubs in which students can participate outside of the classroom.